Try teaming a white print sleeveless top with a yellow mini skirt to create a chic, glamorous look. Kick up the cool of your outfit by finishing off with Klub Nico Ryna Sandal. If you're all about functionality dressing when it comes to your personal style, you'll love this extra cute pairing of a white knit oversized sweater and red denim shorts. Spruce up this outfit with Klub Nico Ryna Sandal. 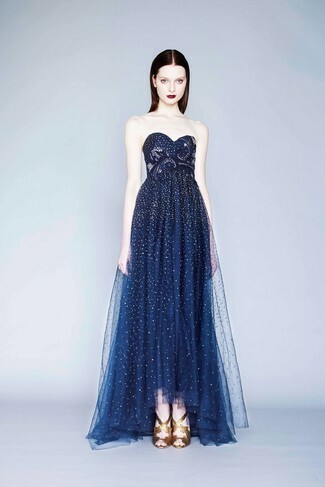 Dress in a navy beaded evening dress and you'll look stunning anywhere anytime. Klub Nico gold leather heeled sandals will deliver more playfulness to your ensemble. If you're on a mission for a casual yet incredibly stylish outfit, go for a mint coat and a mint chiffon maxi dress. Both garments are super comfortable and they will also look great when paired together. To add oomph to your ensemble, finish off with Klub Nico Ryna Sandal from Nordstrom. Rock a light blue print off shoulder dress for a casual get-up. Elevate this ensemble with Klub Nico gold leather heeled sandals. If you don't like putting too much effort into your combos, dress in a black bodycon dress. Dress up this getup with Klub Nico gold leather heeled sandals. Dress in a burgundy cutout bodycon dress for a casual level of dress. Bring instant glamour to your look with gold leather heeled sandals. If you're looking for a casual yet absolutely stylish outfit, opt for a beige coat and a beige mini skirt. Both of these pieces are super comfy and they also look great paired together. Grab a pair of Klub Nico Ryna Sandal to kick things up to the next level. For an outfit that provides comfort and fashion, choose a dark purple embellished midi dress. Let's make a bit more effort now and choose a pair of gold leather heeled sandals.